Today is a beautiful sunny day in San Antonio. The birds are chirping and you can see that spring is slowly coming. A few days ago on Tuesday it was a different story. It was actually snowing. Big beautiful flakes were falling and my husband and I were so excited because snow is not something we see where we live. The snow fell for about 20 or 30 minutes and then it was gone. But it was a moment where you stand at the window and take it all in because you never know when you’ll see something so beautiful and serene. Today the sun is shining, still cold, but you can hear the birds chirping and you’re counting the days for spring. It’s almost here! 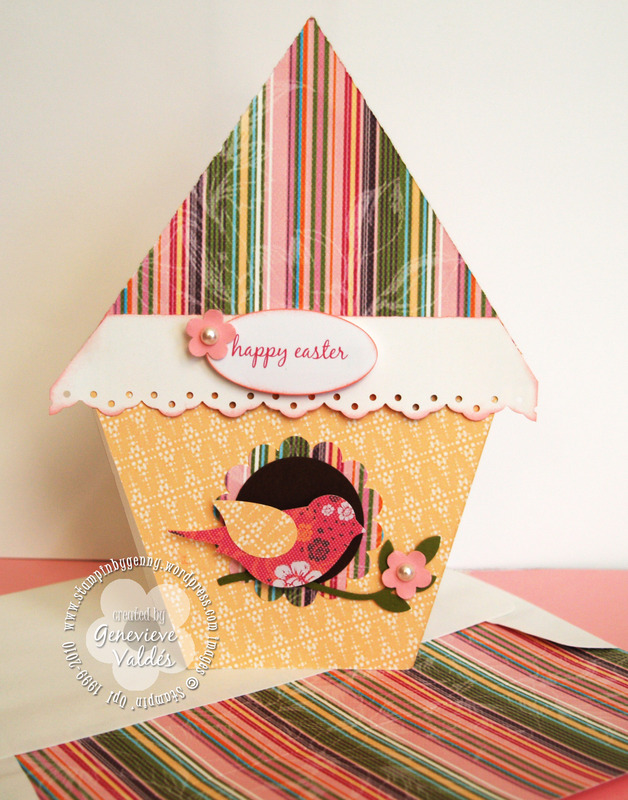 Inspired by the sunny weather I created this Easter birdhouse card. I had run across this birdhouse card on Janet’s blog. You can also find the template there. I changed it up and put a different roof on mine. Here is my card. I was also surprised to see that on PPA they are having an inspiration challenge about birds so I am also going to post my card there for their PPA31- An Inspiration Challenge. All the background papers are printed from My Digital Studio’s Sweat Pea kit. Adorable birdhouse – perfect for the challenge! Thanks for playing @PPA! This is so cute and very cleverly done with your punches! How cute! I love the colors that you selected! Thanks for playing @ PPA!